I was in the checkout line at the grocery store today and I noticed a guy next to me wearing a helmet and holding a bushel of bananas. I figured either he was a cyclist buying bananas to refuel with or someone with a great fear of slipping on the banana peals they were about to buy. 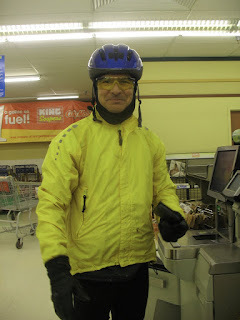 As I started talking with Michael Javaras, I soon realized he was definitely a cyclist and not just an over protective banana buyer. We were both really excited to talk about bicycles as transportation, the differences between Pueblo and other cities we've lived in, the upcoming community P.A.C.E meeting and about bicycles just being all around fun to be on! We also made tentative plans to meet up later to ride some of the mountain bicycle trails on the South Shore of Pueblo Reservoir.